Looking for how to cover your door during the painting or remodeling process? Trimaco’s new Plastic Slip On Door Covers do just that! Protect your doors from dust, debris and paint during any type of job. 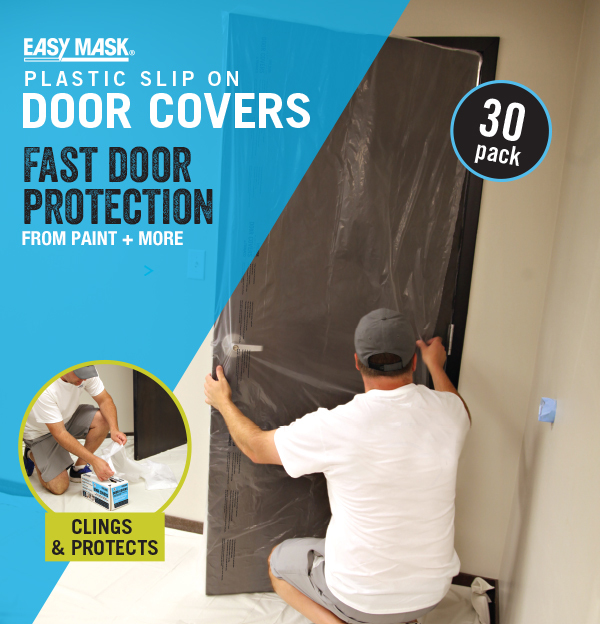 This simple, and time-saving product is made with 0.7 mil static cling plastic and can be easily slipped over a standard 3-ft x 7-ft door. The unique shape of the cover keeps the top and outside part of the door protected, yet remains open on one side for easy installation and clean up. The Trimaco Plastic Slip On Door Cover provides superior temporary surface protection for both commercial and residential jobs. Packaged in a convenient 30-pack dispenser box, the perforated edges make each door cover easy to assess. Just pull, tear and apply for complete temporary protection! Check out the pull product details here.